Inspired by a Mennonite church in Virginia, members at Joy Mennonite decided they wanted to share a message of welcome by distributing “Welcome Your Neighbor Yard Signs”. Immanuel Mennonite Church in Harrisonburg, VA started the now nationwide movement in response to negative rhetoric about immigrants. 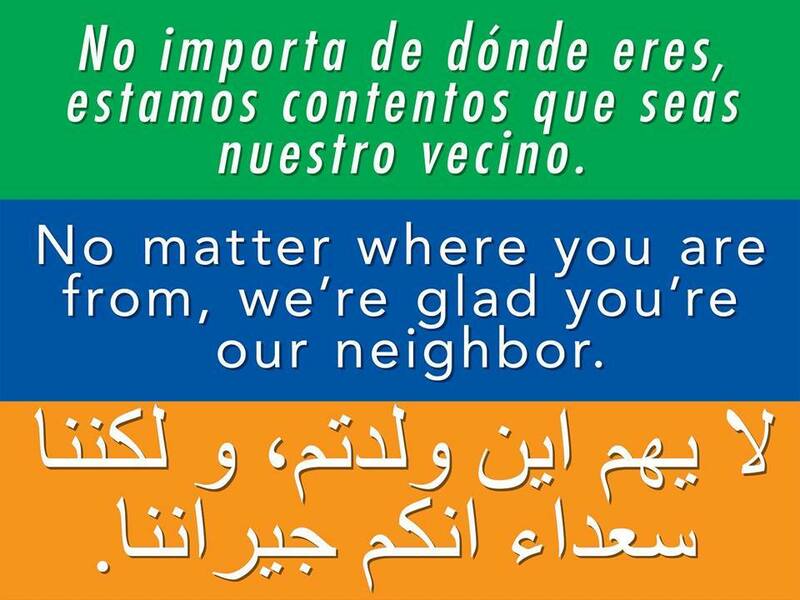 The signs are three colors and display the message, “No matter where you’re from, we’re glad you’re our neighbor,” in Spanish, English, and Arabic. Our hope is that this message will let people who may feel isolated or targeted right now know they have neighbors who appreciate their presence in and contribution to Oklahoma City. To learn more about the history of these signs, check out this article. If you are interested in getting one (or more) of the “Welcome Your Neighbors” yard signs in the OKC area you can fill out the form below. Our signs are made on 24″ x 18″ doubled-sided corrugated plastic and come with a metal stand. Once you have filled out the form, we will contact you with more details about picking up your sign at our church in OKC. The church is asking for a $10 suggested donation per yard sign (with any profits going toward the work of Joy Mennonite Church), but don’t let the cost stop you if you want one.